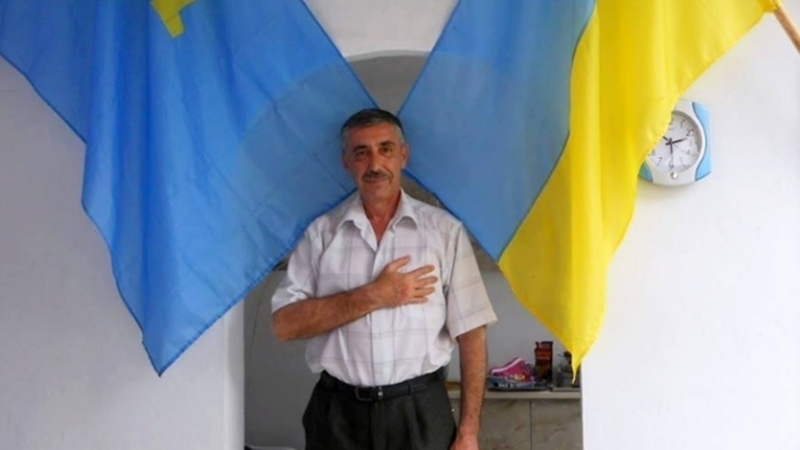 February 12, in the occupied Crimea (Feodosia), a court session was held on the case of Suleyman Kadyrov, a Crimean Tatar, who is tried by the occupation authorities for the words: ‘Crimea is Ukraine’. The activist is supported by his friends and associates, who came to the building of the Feodosiya city court, Human rights organization Crimean Solidarity reports on Facebook. According to human rights activists, not indifferent people organized hot tea and coffee near the courthouse. “On this cold winter day, the support of friends and compatriots inspires Suleyman-aga and everyone who is with him today,” the message says. Meanwhile, during the trial, a break was announced until 2:30 pm Kyiv time. "Judge" summoned a state expert-psychologist Emine Kudusova for questioning. Reference: on October 24 in the annexed Crimean a Crimean Tatar Suleyman Kadyrov, who is suspected of terrorism, was summoned to the so-called department of the Federal Security Service of the Russian Federation in the Crimea for "familiarization with the case materials." On October 18, the occupation authorities charged Suleyman Kadyrov of extremism. He is charged under Article 280 (part 1, part 2) of the Criminal Code of the Russian Federation ("Public calls for actions aimed at violating the territorial integrity of the Russian Federation", "The same acts committed with the use of mass media, including information and telecommunications networks (including the "Internet" network) ").